The murky green color of Rio’s Olympic diving pool has prompted closures, according to several Olympic divers. “Diving pool is closed this morning. Hopefully that means we haven’t been diving in anything too bad the last couple of days!,” British diver Tom Daley tweeted on Aug. 12. Diving pool is closed this morning. Hopefully that means we haven’t been diving in anything too bad the last couple of days! German diver Stephan Feck posted on his Facebook page a photo of himself pinching his nose in disgust while standing near the pool. “The moment you want to do some workout and the pool is closed the whole venue smells like somebody has fart #goodmorning #failed#tollermensch,” he captioned the photo. At the start of the Summer Games, the diving pool at the Maria Lenk Aquatic Center, had been a bright hue of blue. However, on Aug. 9 the diving pool started to turn green, followed by the water polo pool the next day. Initially it was believed that algae was the cause of the sudden color change, but Olympic officials concluded that a chemical imbalance was the reason for the change. 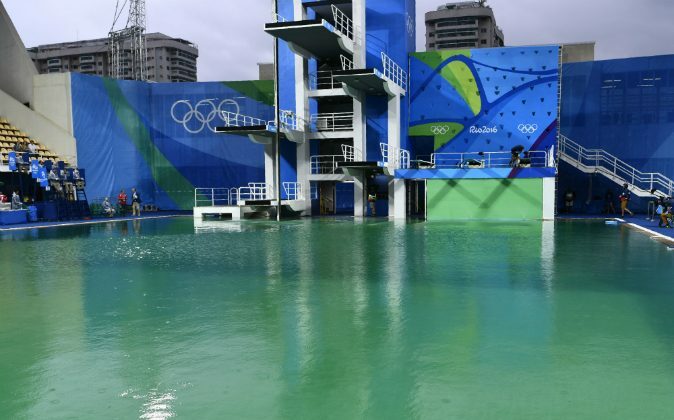 “Mid-afternoon, there was a sudden decrease in the alkalinity in the diving pool, and that’s the main reason the color changed,” Rio Spokesperson Mario Andrada said at a press conference on Wednesday. According to Andrada, the recent downpour of rain and numerous athletes in the pool were possible factors that contributed to the verdant pool. Olympic officials have reassured athletes that the color transformation isn’t detrimental to their health. Pool technicians have used huge quantities of chlorine to change the water back to its original color, which has become bothersome for some athletes. The reason for the pool closure or when it will re-open have not been revealed by officials.